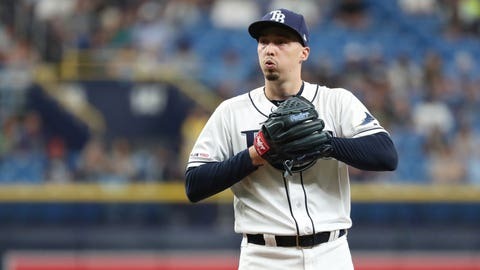 The Tampa Bay Rays have placed ace left-hander Blake Snell on the 10-day injured list after he broke a toe on his right foot while he was at home Sunday night. ST. PETERSBURG, Fla. (AP) — The Tampa Bay Rays have placed ace left-hander Blake Snell on the 10-day injured list after he broke a toe on his right foot while he was at home Sunday night. The 26-year-old Snell got hurt when he got out of the shower and then attempted to move a large granite item. The reigning AL Cy Young Award winner says it was a “really dumb” move. Snell is 2-1 with a 2.16 ERA in four starts this season. He is eligible to return on April 24 and thinks he might miss just one start. Tampa Bay also promoted right-hander Emilio Pagan from Triple-A Durham before Tuesday night’s game against Baltimore.